JUNE 06 - 08, 2019. Green Economy Congress is a series of interactive, multidimensional events designed to create and further build up on the notion of necessity for transition to sustainable and fair economy. Green economy is one of the most exciting concepts that is holistic in its form - it generates development and respect regional and global ecosystem, results in improved human well-being and social equity, while significantly reducing environmental risks and ecological scarcities. For three days all participants will have the opportunity to listen to some of the most impressive economists, innovators, entrepreneurs and decision makers, to share their stories and discover ways to promote an alternative vision for growth and development across the world. The aim is not only to raise awareness on green topics, but also to create a sustainable networking platform to enable green initiatives to execute faster, on international scale. Besides lectures and panel discussions, this years Green Economy Congress will support green startups with providing workshops on topics like green PR and marketing, fundraising and crowdfunding. With sustainability increasingly becoming a subject of interest and importance, starting green initiatives and businesses is on everyone's mind. The organizing team started this project believing that economy of the future will be green. We believe in the future where the global consumption of natural resources is regulated to the point where nature’s capacity to regenerate is secured. We believe in a low-carbon sustainable economy with a focus on dialogue, knowledge exchange and wide participation. We believe in small actions making immense changes. We have already secured the shift in perspective. We are now taking the step forward. The world we live in is going through radical transformation which is changing the fundamental values on which industrial era was founded on. Multiple crisis caused by growing inequality and environmental destruction need an urgent and sustainable answer. Economic parameters that measured growth and success are changing and the biggest assets today are knowledge and experience. Using the expertise the humanity acquired, via green economy we are unleashing new productive forces to create more just and sustainable world. For three days in Belgrade, using lectures, panel discussions and workshops we will try to map this momentum. Get to see our best side! We have prepared a range of exciting activities for you to see while in Belgrade! Your visit to our beautiful capital should not only be about attending the conference. Based on your interests, we will prepare a set of activities (lectures, expos, viewings, discussions, etc.) that you will be able to attend while here. Do not hesitate to let us know what you would like to see/hear in the application form. The city of Belgrade is very famous for its rich historical background which dates back to at least 7000 BC. Nikola Tesla Museum and a special presentation on Mihajlo I. Pupin, two of the greatest inventors of all times, are just some of the things you will have an opportunity to see. Numerous tourism magazines have praised Belgrade for its exceptional night life, some of them even calling it the party capital of Europe. To justify these claims, we are planning on showing you the best of it. Our team is carefully preparing the best mix of activities. There will be something for everyone. We are taking you to Nikola Tesla Museum! The Museum holds more than 160,000 original documents, over 2,000 books and journals, over 1,200 historical technical exhibits, over 1,500 photographs and photo plates of original, technical objects, instruments and apparatus, and over 1,000 plans and drawings. The visit will be arranged by official tour guides and beside the presentation will include live demonstration of some of the inventions Tesla made during his lifetime. EARLY BIRD DISCOUNT: 30% FOR PEOPLE APPLYING UNTIL APRIL 21th, 2019. Participation for the local participants is 3000 RSD and it includes welcome cocktail, conference package, access to all panels, refreshments, the official GEC 2018 Certificate and the social program. Participation for the Ex-Yu participants is 99€ and covers everything described under Fee + Hostel package. The information you provide will be used for processing your application and will not be sold, rented or shared with third parties. Because of the complicated procedures in Serbia, organizers will not take in consideration applications from countries that need visa for entering Serbia. In case you don't have a LinkedIn profile, paste the link to your social media profile of choice. What are you studying and where? If you already graduated, what is the latest degree you obtained and where? First and a third day of the Green Economy Congress is organized by Networked and Group for analysis and policy - making with support of numerous partners. 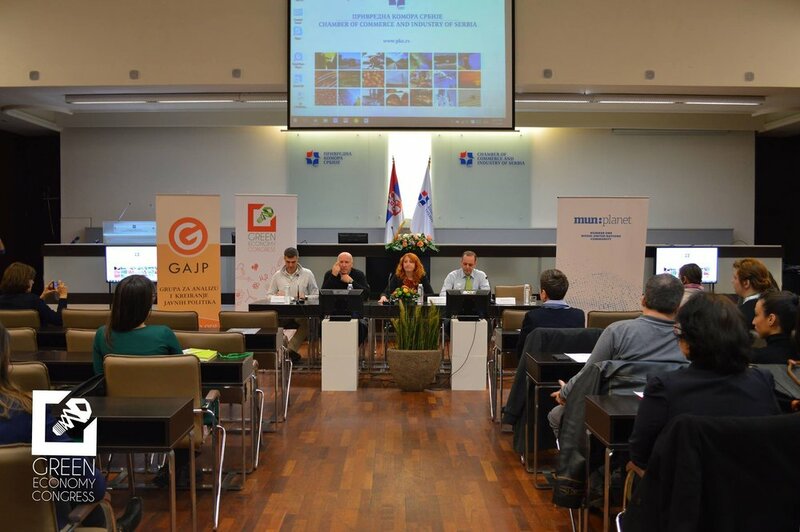 Second day of the Green Economy Congress is organized by Green European Foundation with the support of Networked Serbia and with the financial support of the European Parliament to the Green European Foundation. Networked NGO. All rights reserved.